Well, I am not sure I can accept this seeing as the King is most definitely not your kitty, yet I really wanna roleplay this so ACCEPTED. Walking around the trees, Kimbra looked to Bolt, who concentrates sternly on the path ahead. Kimbra wanted to say something, say something badly. She didn't know how to say it though. Spit it out Kimbra, you sook! she heard her mind shouting at her. She was about to open her mouth but nearly runs into a large tree. Kimbra quickly winds around it, trying to keep up with Bolt. Embarrassment filled her mind. "I... I want puppies!" she says vaguely. "I... I mean..." she had no idea what to say. The idea had flooded her mind for ages now, she just didn't know if Bolt felt the same. She froze, waiting for his response. Bolt padded through the trees, Kimbra by his side. He enjoyed the quiet of the woods, and he certainly enjoyed the company, so the walk was rather nice and relaxing. He didn't make an attempt to talk, didn't find a need to, looking straight ahead, casting curious glances every so often at his mate, who seemed nervous for a reason he didn't understand. The crimson furred male was feeling a mixture of amusement, curiosity, and slight worry for the way Kimbra was acting. He was about to say something when Kimbra spoke, her words making him freeze in his tracks, not exactly sure if he had heard right, yet knowing there was really no mistaking what she had said. He turned to her, yellow eyes wide with slight shock. He stuttered in a way that wasn't usual for him. "P-puppies?" he seemed hesitant. Kimbra shook her head and stepped closer to Bolt. "Yes..." Kimbra said quietly. She knew it was a stupid statement but she needed to say it eventually. Ever since she was 1, she loved the idea of starting a family. She only started thinking about that again recently. Bolt was silent for a few long moments, the shocked feeling slowly melting to let other feelings take its place, thoughts racing through his mind, like a forest fire, moving so fast and destroying all in its path. Puppies? Am I ready to be a father? Would I make a good father? Oh Fenrir, what if I do something wrong? All these questions rushed through his mind, his face taking on a thoughtful look, eyebrows furrowing. He snapped out of his thoughts, looking at Kimbra, observing her for a few moments. He had thought of having a family before a few times, and he wanted one. He loved pups. He began to speak, voice strangely quiet. "I want to, but I-i'm unsure." The Alpha male muttered, turning his gaze downwards. "You're unsure? Why? You'd make a great father!" she said a bit too frustrated. If she never had pups, what kind of alpha was she? She looked up at Bolt, innocently. Bolt looked up at Kimbra's words, a weak smile on his face. He asked, curious as to what his mate saw in him that could possibly make him a "great" father. Notes: I've sunk to a new low with posting. This is aweful, it's late at night, I am on a mobile and have no muse. So sorry for cruddy post. "Definitely!" she assured. The fire bending wolf seemed unsure of the idea still. Kimbra looked over her shoulder at the rest of the pack near the main den. "They think so to," she said, meaning the pack. 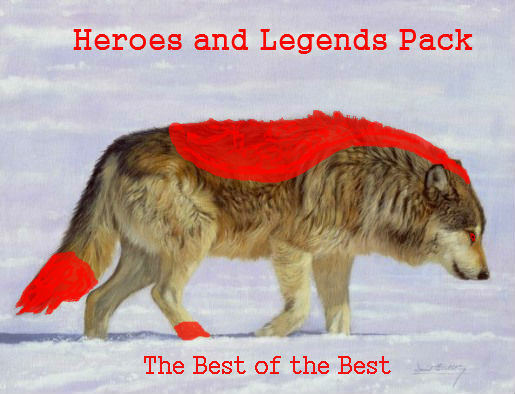 The heroes and legends pack heritage was full of strong, brave warriors. 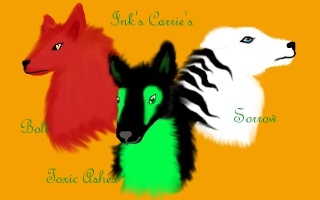 Somewhere along the line, Kimbra's great great great great great grandfather started the pack. She felt it was her responsibilty to continue the bloodline. That couldnt be accomplished without Bolt however. Without Bolt, the lone line of Alphas would stop in its tracks. The pack had survived wars, droughts and rebellions. She wanted to live up to her name. Notes: I dribbled on a bit but i was listening to music so its a bit more detailed. Bolt smiled softly at the words, feeling much more reassured by them. He could be a good father if he tried, right? He certainly would be very good at protecting them. He thought, almost chuckling out loud at the idea of the creature that would dare threaten his pups, running around with flame burning away at its body. He nodded, slowly, eyes still wide as he looked at Kimbra, opening his jaws to respond. Bolt murmured, face scrunching up to find the right words to say, before he sighed, giving up, and just nodded, unable to find anything to say, yet a smile was fixed on his face.